Out for a Saturday night spin on his motorcycle, one man and his passenger entered a Riverview intersection, never imagining that this would be their last ride. When a drunk driver making a left turn careened into them, the motorcyclists were thrown from their bike. Despite wearing helmets, the driver was killed instantly; his passenger survived just a few hours longer. The scenario shines a light on just how important it is for drivers to make themselves aware of motorcycles on the road, and how critical it is for motorcycles to make themselves as visible as possible. If, despite your best efforts, you are involved in a motorcycle accident, a local personal injury attorney can help. The troubling fact is, motorcyclist fatalities occur at 28 times the rate of other vehicle deaths. In 2017, almost 5,000 motorcyclists were killed across the country. Stay focused on the road. 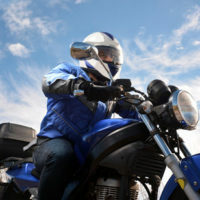 An increase in distracted drivers is connected with a rise in motorcycle crashes, and more than 20 percent of motorcycle fatalities in 2016 involved collisions with fixed objects. Wear a helmet: One study found that over 800 lives could have been saved in 2016 alone, if the riders had simply been wearing a helmet. In Florida, 50 percent of fatalities involved riders who not helmeted. Keep your bike in good working condition: regularly check headlights, brakes, signals, tread, and fluids. Even if you take every precaution and you follow every law, your lack of visibility on a motorcycle puts you at risk. If a driver is distracted, negligent, or reckless, and you or a loved one suffers the consequences, you need the experienced and aggressive legal team at the Law Offices of Robert W. Elton on your side. Contact us today for a confidential consultation in Daytona & Ormond Beach.